At some point, someone has probably told you how waterproof breathable fabrics work. They probably mentioned how waterproof breathable fabric is microporous. It has billions of little holes that are too small for water droplets, but just right for sweat to escape. We like that explanation because it’s easy to wrap our minds around. It’s simple. It makes good sense. It also happens to be wrong. If you need to go on believing that billions of little holes are the only technology keeping you dry, I won’t blame you. It’s easy to believe that this is how waterproof fabrics work. After all, your waterproof breathable fabric is going to protect you from the elements no matter what you believe about the science behind them. But, if you want to follow me down the rabbit hole of surface energy, hydrophilic coatings, and long-chain perfluorinated polymers, I can show you the truth. And you’ll be richer for it: more able to make decisions based on sound textile science. To understand exactly how your waterproof breathable textile works, you must understand some terminology. Here, we will go over some terms in plain English that are likely to come up frequently as we begin to explore different materials and construction of waterproof breathable fabric. Hydrophilic – meaning “water-loving” – refers to the tendency of a particular material to hold on to water. Hydrophilic materials are those that mix with, dissolve in, or are wetted by water. On the other hand, hydrophobic – “water-hating” – materials repel or at least fail to mix with water. Both types of materials are used in the construction of waterproof breathable fabrics. We will see why later. This is a pretty weighty scientific topic, so we’ll just use a simplified metaphor to describe surface energy. Think about water: we know that the hydrogen bonds in water help to create a phenomenon called surface tension. Surface tension is the reason that water forms into droplets and doesn’t just spill and run all over. In basic terms, surface energy is the same phenomenon as surface tension, but it’s referring to solids instead of liquids. Solids with low surface energy will “pull” less on liquids that come in contact with them. If the liquid has a higher surface tension than the surface energy of the solid, then wetting is less likely to occur. Diffusion refers to the tendency of a system toward equilibrium. For instance, hot, steamy air inside a jacket will diffuse through a fabric to mix with a cooler, drier environment. This is the basis for how most waterproof breathable jackets manage the humidity building up inside. However, the specific mechanisms that drive the transmission of water vapor are slightly different depending on the fabric type. There are currently three different types of waterproof breathable fabric. Each of these has a slightly different approach to maintaining waterproofness and breathability. These textiles include either a microporous membrane (layer) or coating – typically constructed from expanded polytetrafluoroethylene (ePTFE) or polyurethane (PU). These layers or coatings are filled with billions of tiny holes which help the textile to keep a very low surface energy. Since the surface energy is lower than the surface tension of water, this fabric will keep raindrops out. Meanwhile, vapor pressure inside the fabric forces moist air out through the pores. However, oils and dirt can increase the surface energy of these materials. 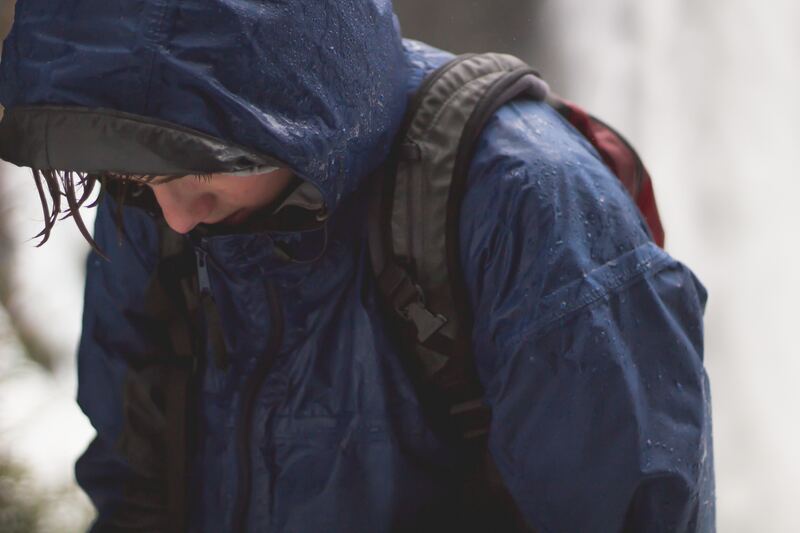 If you notice that your rain jacket has started to wet through, it may be time for a wash. Be sure to use soap designed for use with technical gear and to reapply a durable water repellent (DWR) as necessary. eVent is a microporous ePTFE membrane in which the pores have been treated with hydrophobic and oleophobic (oil-repelling) chemicals. This helps to fight the increase in surface energy due to soiling. As a result, eVent stays waterproof longer than untreated textiles. Additionally, it retains maximum water vapor transmission due to its unobstructed pores. As the name implies, the continuous hydrophilic membranes and coatings do not contain any pores. They’re usually made of polyurethane (PU). While they do not allow water to penetrate from the outside, neither do they allow air to pass through. Continuous hydrophilic membranes instead rely on diffusion to transmit water vapor. Moisture from perspiration is attracted to the hydrophilic material, which adsorbs water molecules. The water is then desorbed and passed along like a bucket brigade. The moisture is slowly adsorbed and desorbed from the warm, humid interior of the fabric to the relatively cooler and drier outside. While these materials are incredibly waterproof, they are also the least effective at water vapor transmission. Not to mention that these membranes and coatings function much better in colder weather. As a result, fabrics using these materials may feel stuffier than some other waterproof breathable fabrics in warmer temperatures. Gore-Tex combines an ePTFE microporous membrane with an incredibly thin coating of PU. The PU partially fills in the pores, providing enhanced waterproofing and durability. Gore-Tex transmits water vapor by diffusion in much the same way as the continuous hydrophilic membranes and coatings. Gore-Texs tend to be the most durable of the waterproof membranes. The ePTFE membrane allows the PU layer to be much thinner than those found in continuous hydrophilic fabrics. While you can’t see a difference, you can feel it. Water vapor transmission occurs more rapidly across a thinner membrane, so Gore-Tex tends to feel less clammy on the inside. While the heart of any waterproof breathable fabric is the membrane or coating that’s applied to it, the way all the layers are sandwiched together has a huge impact on the overall feel and functionality of the rainwear. This type of construction means that the waterproof membrane or coating is applied directly to the inside of a tough and durable face fabric, making up one layer. The other layer is a liner usually made of a moisture-wicking fabric or mesh. This protects the inside of the waterproof layer. These tend to be moderately priced. They’re a great choice for urban adventurers because they’re durable and breathable. They may be a bit heavier than the other construction types, but they do pack nice and small for easy stowing. As in the 2-layer construction, here a waterproof membrane or coating is applied directly to the inside of a face fabric. Then a protective layer is printed directly on the membrane to minimize abrasion on the waterproof surface. This is the half layer in the 2.5 layer construction. Clothing made with this type of waterproof breathable fabric tends to be the lowest price and the lightest weight. However, it’s not as durable as 2-layer or 3-layer construction. As a result, you may find yourself shelling out for your rain shells over time. These fabrics feature a durable face fabric with a waterproof membrane applied directly to the inside (no coatings here). A fabric inner liner is then adhered directly to the waterproof membrane. This forms a sandwich with protective fabric on either side of the waterproof membrane. Clothing made with this fabric has the best performance, breathability and durability. It’s also the priciest. If you’re a rugged outdoors enthusiast, or you just want a layer that will last for a very long time, this could be the right construction for you. All waterproof breathable fabrics are treated with durable water repellent (DWR). DWR is typically made with fluoropolymers. These bond to the surface of the waterproof breathable fabric and stick straight up like a microscopic bed of nails. Except each of the nails has a small amount of wobble. This lowers the surface energy of the solid. When surface energy is significantly lower than the surface tension of water, the water can pull together into a rough sphere shape. This allows the water to bead up and roll off the surface of the fabric. Allowing the water to bead up and roll off is important because it keeps the face fabric from wetting through. It also keep the waterproof membrane protected from having water sitting directly on it for too long. As oil and grime accumulates on the surface of your waterproof breathable fabrics, your DWR will likely lose some of its performance. If you find that your waterproof breathable fabrics are wetting through, put your garment in the wash with soap formulated for use with technical gear. Washing and drying DWR revives the polymers. If you’re always wearing a pack or otherwise causing abrasion on the surface of your clothing, this could strip the DWR from the item. If washing and drying doesn’t help with wetting through, we recommend applying a spray-on DWR treatment at home. Exciting new advancements are being made with short-chain fluorinated polymers that could allow for safer, more effective DWR treatments. These polymers are not yet available for commercial use, but we’re really looking forward to seeing what they’re capable of. As we said earlier, you don’t have to know how your waterproof breathable fabrics work in order to use them. They’re going to perform for you whether or not you research surface energy, construction, or DWR. However, having at least a passing knowledge of how your rainwear or waterproof shoes are formulated can help you know how best to care for them. You’ll understands the strengths and limitations of your technical gear. You’ll have a deeper appreciation for what it’s doing for you while you’re out performing. And you’ll be better able to understand the ins and outs of different proprietary waterproof breathable fabrics.